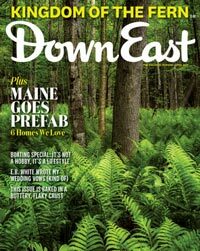 View the wild natural beauty of Downeast Maine islands —and a working lighthouse that most other people will never see! Enjoy an up-close and personal view of Jonesport's Moose Peak Light, privately owned but still maintained by the U.S. Coast Guard. So near, you may never need your camera's zoom! 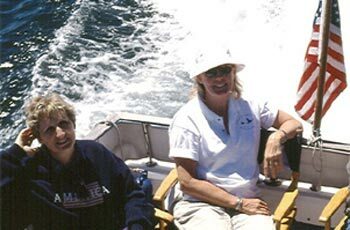 Our boats can slip close inshore – so you'll have a unique opportunity to observe seabirds, seals, and other wildlife you'd never see from land. Weather permitting, your cruise will also include a sea-level view of Moose Peak Light on rockbound Mistake Island, flashing warnings to mariners since 1827. 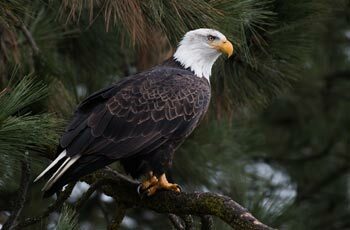 Bald eagles abound. Loons, great blue herons, arctic terns, razorbill auks, and several kinds of gulls may also fly past. Sometimes curious harbor porpoises surface for a look. and home of Coastal Cruises. 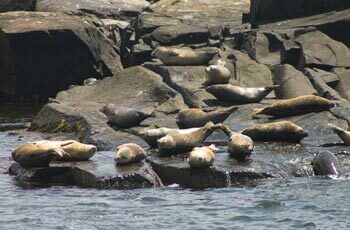 When the tide's down, we often pass seals and cormorants basking on the ledges. Discover where pink granite blocks as big as refrigerators were loaded onto schooners bound for Boston and New York. We'll show you the lost town of Sealand, where lilac and apple trees mark the old homesteads. And you'll see where Samuel de Champlain anchored in the early 1600s while mapping Maine for the French king Henri IV. You can book a personal cruise for one, or up to as many as six people, to tour unspoiled Moosabec Reach and the beautiful islands of the Eastern Bay.